The last time we caught up with up with Greg Lounsberry he was working under the name of Rocket4357 Project. 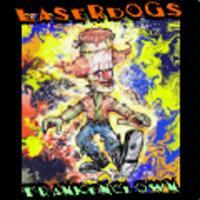 This time around, he comes at us with his Laser Dogs project and Frankenclown the CD. This album is interesting. The music here is often awe-inspiring. There are times when I found myself scratching my head to figure out how he could take something as complicated as some of the music was, and make it catchy, almost pop like - it's downright scary. If I had to pick something to complain about, though, it's that there are times when the songs seem to carry on a bit long without changing enough. Still, that only happens at a couple points on the disc, and there is some very, very interesting stuff here. The sound is quite original, but there are moments where you might think of California Guitar Trio, Djam Karet, Pink Floyd and others. You can get more info, listen to sound clips or order the CD from the Greg's website. This has a bluesy rocking approach, but the guitar soloing on the intro to this one is pretty spectacular. Non-lyrical vocals eventually come over top, then take control, a new crunchy progression moves this on from there. The vocals eventually return and the cut again shifts gear, this time to a riff rock based progression that has the 1970's written all over it. When the solo comes atop this it reminds me a bit of David Gilmour. The vocal section, seeming like the monolith in 2001- A Space Odyssey that causes everything to evolve returns and the cut moves back to its opening segment which fades to love only the vocals (now recognizable as loops) to end the piece. Wow, this one is cool. It seems to me to be about equal parts Echolyn and Frank Zappa. This one doesn't grab you as prog at first, but the cool odd bent to the otherwise straightforward sound puts it there. The bass and guitar both put in impressively crazed turns here. This drops to just an acapella take on the chorus to end. The bass line on this immediately calls to mind Chris Squire. It in some ways feels like his form of songwriting, too. Still other elements show up as well. This is extremely accessible yet challenging in its nature. It's amazing how catchy Lounsberry can make his prog rock compositions. There are breaks here that call to mind the vocal harmonies of Crosby Stills and Nash. The bridge gets just a little dissonant and feels just a tiny bit like King Crimson, but is also incredibly powerful. This song is purely amazing. A hard-edged groove starts this one, and it begins its journey from there. This to me feels a little like Adrian Belew's solo material. The lyrics are a trip - rather harsh, but funny. A cool groove starts this, feeling a bit like California Guitar Trio meets Djam Karet. This is a pretty infectious and rather deceptively complex instrumental. I love the bass riff that takes it a few times later in the track - simple, yet highly effective. I guess my only complaint here is that it goes on a bit too long. Starting with a processed voice, sort of like "Mr. Roboto," this becomes a bouncy, pounding rock groove after a build up that sounds like keyboards, but isn't. This moves around in this format for quite sometime in a very entertaining fashion before eventually moving out into a new melodic jam. This gives way, after a while to something easy to mistake for keys (in actuality guitar and bass run through a leslie), then to the earlier section. A bouncy acoustic mode takes it later still to move it forward to a quick burst of weirdness. Then another mid tempo rocking jam becomes the order of the day. This moves through quite a few changes, but drags on too long for me. The jam late in the cut that leads into near chaos is quite cool, though. Weird effects eventually end this. A cool mellow jazzy texture, a bit Floyd-like comes in to pump this one out. This instrumental eventually drops to just drums and bass, then fades to finish. This instrumental has a great fun texture and is somewhat otherworldly at first. As it carries on it eventually drops to themes from other points on the CD.